RC Bulldozer Videos At Work! 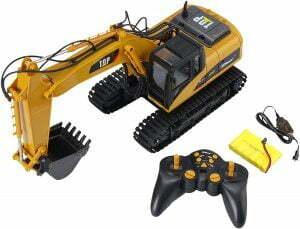 The toy manufacturers are getting more and more realistic with their remote controlled bulldozer replaces these days! When I was a kid, the latest and greatest from John Deere and Caterpillar didn’t look anything like the toys of today. Some of the rc construction vehicles even have working lights, hydraulic rams, and even sounds mimicking a gas powered machine! 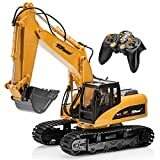 Pretty cool, and any of these RC dozers are almost guaranteed to put a smile on and little kids face and adults alike who enjoy their favorite pastime. 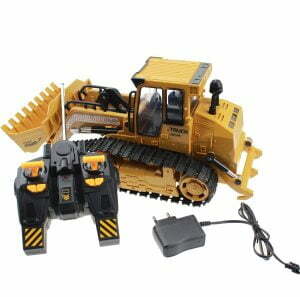 Product Name: 6 channel caterpillar truck wireless control engineer truck bulldozer toy. 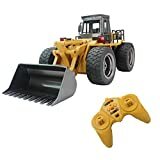 Function:6 channels–it can go forward backward turn left turn right.the shovel lift up and down with the remote controller the flashing light is on. Notice: Before you charging the battery make sure the battery interface Cable connect well in case of cause danger children should be supervised by parents or guardians while playing. 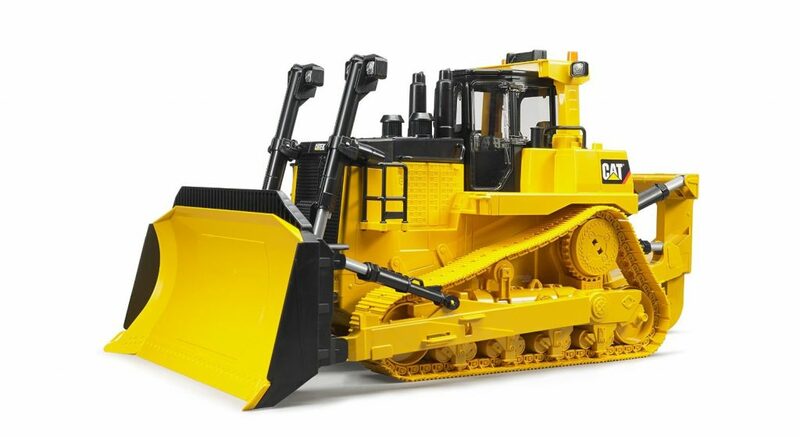 This is not an authentic Caterpillar equipment brand, it is a replica rc model. 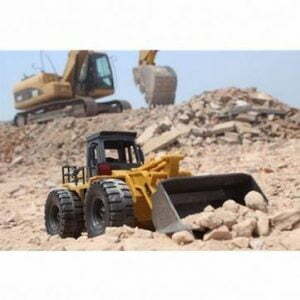 These dozer toys are not radio controlled models, but they’re tool cool not to share! Some are all metal construction, and have very realistic hydraulic rams for the blade and ripper attachments. 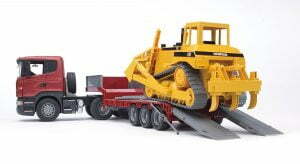 This Bruder CAT Large Track Dozer is a tough German-made toy built for regular use in the sandbox or backyard. Moving parts and an extra-large size provide realistic action. Movement: Hand manipulated, Scale Size: 1:16, Safety Warning: Choking hazard, adult supervision is needed, Dimensions L x W x H (in. 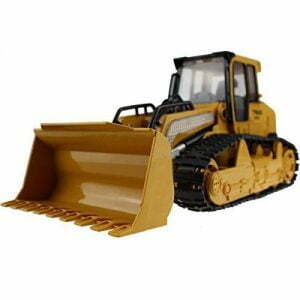 ): 23 x 12 x 12, Material Type: ABS plastic, Recommended Ages (years): 4 and up, Style: Dozers; From the Manufacturer; The CAT Large Track-Type Tractor is just like the real thing. Built with sturdy ABS plastic and amazing details. This model like tractor is made to be played with in the sand box. Multifunction blade and ripper/scarifier move up and down. The tracks are CAT yellow and feature 62 individual links for realism and traction. The doors of the cab open to display the detailed interior. The blade is heavy duty and tips forward and backward with realistic hydraulics. The CAT Large Track-Type Tractor is just like the real thing. Built with sturdy ABS plastic and amazing details. This model like tractor is made to be played with in the sand box! Tractor has blade that tilts forward and backward, raises and lowers. Counter-weighted double-shank ripper raises and lowers. Plastic grab rails and handles, interior cabin detail and metal tracks with movable individual links. Sharply detailed. 1:50 scale. Die-cast metal scale model replica. Authentic metal tracks. Tractor blade tilts forward and backward, raises and lowers. Counter-weighted double-shank ripper raises and lowers. The Scania R-series Low loader truck with Caterpillar Bulldozer offers children realistic and active playing fun. This Scania Low Loader Truck with CAT Bulldozer by Bruder has a Driver’s cab that tilts forward to see engine. The Trailer of the Low Loader Truck is detachable. This Scania has soft rubber sculptured tires. The flat bed ramps lift up and are held by chains or can tilt down when the chains are unhooked. 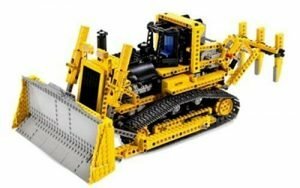 The CAT Bulldozer’s blade and rake move up and down. The Bulldozer has real rubber tracks. 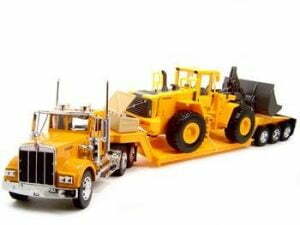 1:32 scale heavy-duty truck replicas feature die-cast cab and functional door, moving wheels and lifelike details. Each with authentic colors, realistic graphics and various moving parts. Ideal for both collectors and kids. The Top Race® Professional Heavy Duty Metal Excavator toy model (TR-211) is a replica to an actual Excavator working at a construction site. 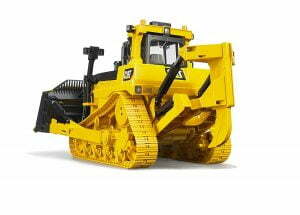 All functionality that operates by an actual yellow caterpillar construction vehicle applies to this vehicle as well. The Top Race® 15 channel construction truck is not a small kids toy it can really dig in any direction with the 3 separate motors on its digging arm and with it’s heavy duty steel shovel, transport dirt, sand, etc. from one location to another or onto a dump truck. It moves forward, backwards, right, left, and cab turns in a 680° rotation. Equipped with a 2.4ghz transmitter which enables you to operate on a distance of at least 100 feet or more. If you bought the Top Race® 7 Channel Excavator TR-111, this TR-211 is your next step before you look into expensive gas hydraulic excavators. Since the TR-211 Rc tractor is also extremely detailed in it’s design it can be displayed beautifully on a shelf as a model of an actual excavator. Toprace also makes affordable remote controlled trucks if you’re looking for those too. Feature: 1.Turn front, turn back, turn left, turn right, bucket rise and decline.The lamp before and after light up. 2.Double motor four-wheel drive. Enough power to support climbing effortlessly. Bucket,cab and wheel are all made of hard metal. Rubber wheels increase traction on this digging toy on slippery terrain, and are more wear-resistant. 3.Bucket maximum load 220g. 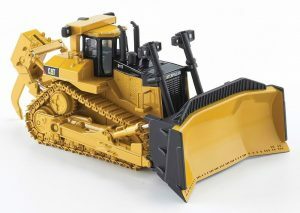 4.Irrespective of the size and other physical attributes, the fact that this RC bulldozer toy can really work like the real thing is the most amazing aspect of these models. 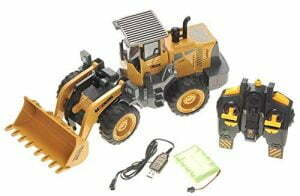 This is a brand new radio controlled Construction Bulldozer Truck. It simulates the true style, look & feel. It comes with all the items necessary to get you started and play immediately.